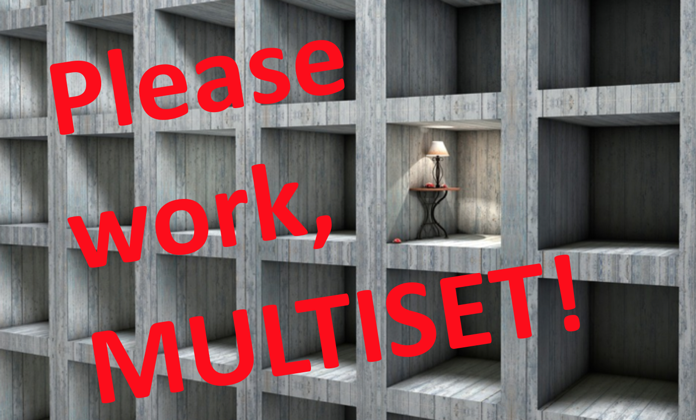 Why Won't MULTISET Work for Me? 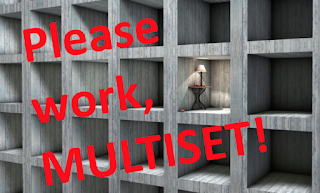 Struggling to get MULTISET in PL/SQL to work for you? Check out this article, which explains how to make it work. I recently got an email from an Oracle Database developer who was trying to get the MULTISET operator to work in his code. He'd created nested tables of records and found that MULTISET UNION would work but MULTISET EXCEPT would not. PLS-00306: wrong number or types of arguments in call to 'MULTISET_EXCEPT_ALL"
I will confess that it took me longer than I'd like to admit (but I just did!) to get to the heart of his problem, so I figure others might get similarly befuddled. Time for a blog post! Two objects of nonscalar type are comparable if they are of the same named type and there is a one-to-one correspondence between their elements. In addition, nested tables of user-defined object types, even if their elements are comparable, must have MAP methods defined on them to be used in equality or IN conditions. Note: the code shown below may be executed on LiveSQL here. First, I create some database objects. OK, you might now be saying: "Hey, that's a bug! MULTISET EXCEPT is broken." But wait, let's do some more testing. How about a nested table of numbers? Does MULTISET EXCEPT work with that? No problem there: I "minused" a collection from itself and nothing was left. So MULTISET EXCEPT works, but only under some circumstances. But why then did MULTISET UNION work? The key thing to remember is this: MULTISET UNION is equivalent to MULTISET UNION ALL. In other words, the MULTISET operators do not by default remove duplicates (which is the case for SQL UNION. You have to specify DISTINCT if you want that to happen. And when I add DISTINCT in the block below, guess what? PLS-00306: wrong number or types of arguments in call to 'MULTISET_UNION_DISTINCT"
Now it fails, just like EXCEPT. What's different? Now the PL/SQL engine must compare the contents of the two collections and to do that, it needs a map method, which returns values that can be used for comparing and sorting. Let's add one to limb_ot: I will specify a mapping based on the length of the name. And when I add DISTINCT in the block below, guess what? It works! Well, I didn't get an error. But did it work? Aren't there three distinct rows in the table? Why does it show a COUNT of 2? Because the map method only uses the length of the name for comparison. Both "arm" and "leg" have three characters, so those two rows are not considered distinct for the purposes of the comparison. Tricky, eh? So if you are going to ask Oracle Database to compare object type instances in a nested table, you'd better provide a map method! And what if you want to compare records in a nested table with a MULTISET operator? You are out of luck. You cannot do this. There is no mechanism built into PL/SQL to compare two records, and there is no way to create a map method on a record type.